We have a night set aside once a week, usually Monday night for convenience and consistency, and it is referred to as Family Home Evening. Now in my home, my children, even now grown, lovingly refer to it as ‘Family Home Screaming’. This tells you right off the bat, we are NOT perfect at this, and if you read my blog, I never pretend to be remotely close to great, much less perfect at anything, so why start now? To gather the family for this ‘special weekly event’ meant bribery to clear the calendar for dinner (as I always asked for anyway) and then afterwards for an additional at least 30 minutes with a unique candy or treat that was worth their effort = homemade dessert, M&M’s etc. It was not always easy. We are all busy, life happens, kids are kids and do not always cooperate, etc., etc., etc. You may ask, so how often was it a joyful experience of loving siblings enjoying each others company for a solid hour every week in addition to time spent just living together? hhmm, let’s just say the police were never called so I deem it successful. MOST of the time there was a good, or at least a decent discussion, with of discovering and new understanding amid the good-natured teasing. This was particularly the out-come when I was willing to just go with the flow, realize we were together and what I had planned was mostly working. I have a rowdy bunch to deal with, remember. With all there is to compete with our time and the exhaustion level of any parent on any given day, why in the world would I put one more thing, especially of this caliber on my plate? With so many other things to juggle and keep in the air, why would I, for the love of sanity, take the time to prepare (or help a younger child prepare) a gospel oriented lesson, a treat aka bribery, or assign these and a few other items out for this Monday Family Home Evening time when it would be SO much easier to just bag it and ‘live and let live’ as the saying goes? One day I asked my son Dallin if he would go fly a kite with me. He kindly said yes, though I knew he had other things he would much rather do that day. We went to a local park where he assembled the kite I had purchased. There wasn’t much of a breeze so Dallin began to run back and forth, working quite hard to get some lift under the kite. Finally, a breeze came along to boost the kite into the air; sending it to dance and spin high above our heads. “Because of the wind” he replied. As I cut the string the kite immediately plunged to the ground. I explained to my son that the kite is able to fly because the string provides the resistance to the wind. As the string is let out, yet held firm, the kite will reach its greatest heights possible. Without the string the kite dives to the ground as there is nothing to hold it up. What does this have to do with having a family gospel oriented activity or meeting every week to teach your family morals and values? 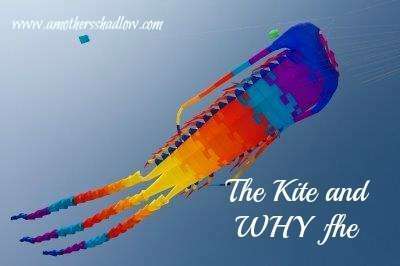 Our children are the kite. As we teach our children correct standards, a strong work ethic and religion, they will have the competence and ability to soar and survive the winds of life. Discipline and self-control are analogous to the string, providing them the foundation to attain any good purpose the set set out to do, while. The wind symbolizes the trials, tests and hardships life inherently brings. What we teach in the home will last their entire life. We may not perceive that it is ‘successful’ always; however, I can promise from experience. What we do not teach as central and essential to us, the world will teach as important, whether we agree or not. The sports, dance and other activities do have their place. But as the saying goes, ‘when the day is done’ what is more important than a knowledge of God, His ways, His place in our life and how to live according to His word because this is what brings peace and happiness. We are regular church goers and lessons are taught in classes on Sunday as well as activities during the week which strengthen what, as parents we teach, but it does not take the place of the responsibility of mother and father (if both parents are involved in the child’s life) being the first and prominent instructor of the most significant education, that of God, Christ and how they want us to live; which is why we set aside Monday night to build the strings of the kites. If our loved ones are set on a strong base of noble principles, they will have the resilience to ascend to unimaginable heights and reach their highest capacity despite challenges. In fact as the winds of life blow stronger and more difficult, our children will soar higher, stronger and with greater strength because of your teaching them about God and His plan for them. Their string will hold sturdy and sure so they will not crash, their heart will not grow faint but will thrive and they will even lift others along their way.